The Florissant Fossil Beds National Monument, Teller County, is an ancient lake deposit that preserves the terrestrial biota that lived in the Florissant valley area of Colorado 34 million years ago. Because of the diversity of its flora and fauna, Florissant ranks as one of the world's best known and richest paleontological resources. Together, the fossil biota and geology provide an incredibly detailed snapshot of the western interior of the United States at the Eocene-Oligocene transition  a period in Earth history when there was a dramatic change from warm subtropical, temperate climate to cooler more temperate conditions. The fossil flora also tells us that during the late Eocene, Florissant was at a similar elevation as today  8500 ft. (2590 m), and from the geology, we know that Lake Florissant formed in an area with an active volcanic eruptive center, the Guffey volcano, which spewed ash and violent pyroclastic flows that buried and killed plants and animals alike, but in the end aided in their preservation. Click on any image to see an enlargement. 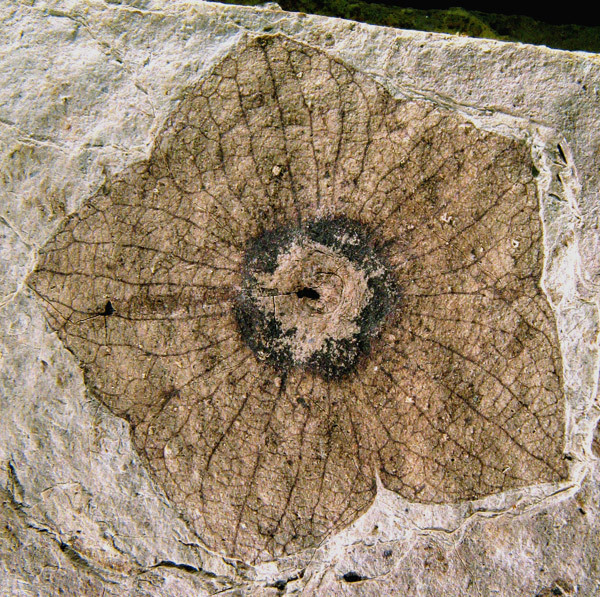 These fossils are from collections studied and published by UCMP Research Associate Harry D. MacGinitie. Top left: A large branch with terminal buds of Sequoia affinis. The tree has features of both the Coast and Giant Redwoods. Bottom left: Calyx of the flower belonging to the extinct species Florissantia speirii. It is related to the family Sterculiaceae. 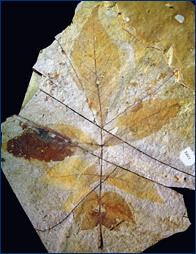 Second from left: Leaf of the fossil hickory, Carya libbeyi. 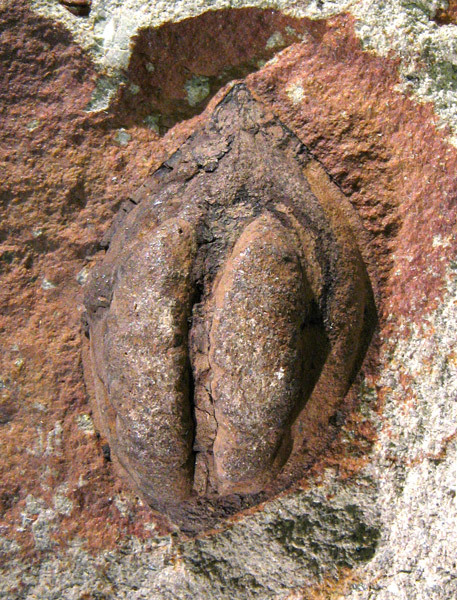 Third: The fossil hickory nut Carya florissantii. This fruit is thought to belong to Carya libbeyi but is given a different name because the leaves and fruits have not yet been found attached. 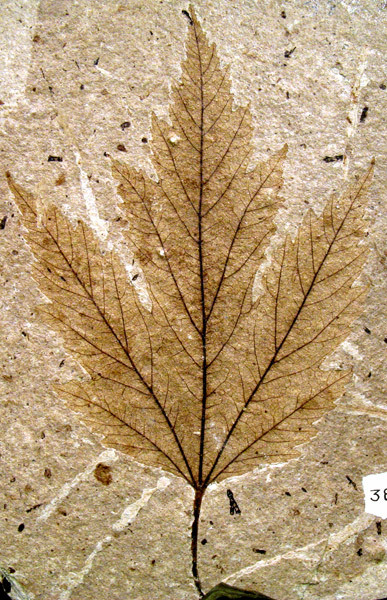 Fourth: A beautifully preserved specimen of the extinct species of maple, Acer florissantii. A photo by Harry MacGinitie of the "Redwood trio." 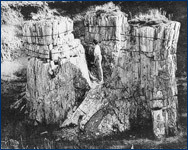 Among the hallmarks of the monument are the remains of the massive petrified redwood trees that once dominated the Florissant forest of 150 plant species. 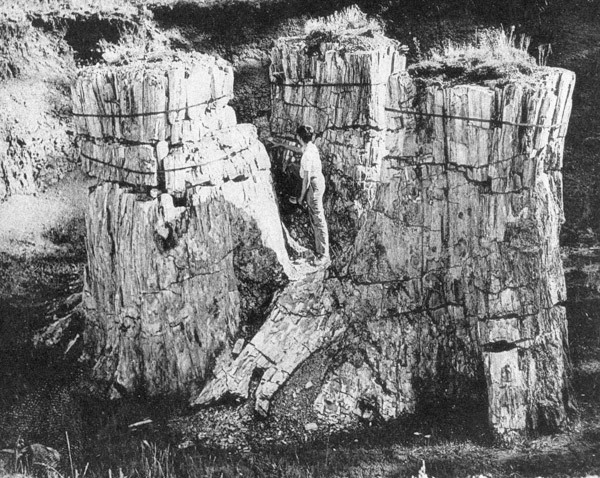 The famous "Redwood trio" at Florissant is the only known fossil occurrence of a redwood "family circle." Modern coast redwoods (Sequoia sempervirens) reproduce from sprouts that grow from the base of the parent tree. These root sprouts can grow to normal size trees especially in cases where the parent dies, as was the case at Florissant. We know that in addition to the redwoods, there were other conifers and hardwoods growing around the lake margin and at higher elevations that provided food and shelter to populations of insects (~1500 species), birds, and a growing list of mammals that include a pigmy opossum, rodents, horses, rhinoceros-like brontotheres, sheep-sized oreodonts, deer-like animals, a tapir-like ancestor of the rhinoceroses, and the oldest fossil mole. Lake Florissant was also home to shorebirds, numerous freshwater gastropods, clams, ostracods, insect larvae, aquatic plants and fish  their remains sandwiched between layers of paper-thin, diatom-rich shales like beautifully illustrated pages of a book. This brings us to face a question of values. The land occupied by the lake beds is not of particularly great value for housing or agriculture, but as a page of Earth history from the dim past it is priceless. There isn't anything else like it. The area is unique and unrivaled, and it is well known all over the world. In 1994, paleobotanist Herbert W. Meyer became the monument's first Head Paleontologist and continues in this role today. Herb was well suited for the position. He met Mac while a student at Berkeley and used the Florissant paleoflora in his dissertation work that focused on evaluating the use of paleotemperature and different lapse rates (the rate of temperature change with elevation) to test their accuracy in estimating the paleoelevation of fossil floras. 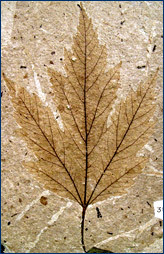 In his 2003 book entitled The Fossils of Florissant, Herb gives an exquisite account of Florissant's history, its scientists, the museums that house Florissant collections, the geology, an overview of the ancient biota with eye-popping illustrations and fossil images, and our current understanding of the paleoenvironment in which the plants and animals lived 34 million years ago. Although the UCMP Florissant collection is not the largest, it is one of the nation's most significant, since many of the specimens were collected, described and illustrated by Mac in his monograph. Click on any image to see an enlargement. 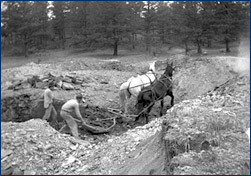 Left: In the late 1930s, using horse power was still the speediest way to remove overburden at Florissant. 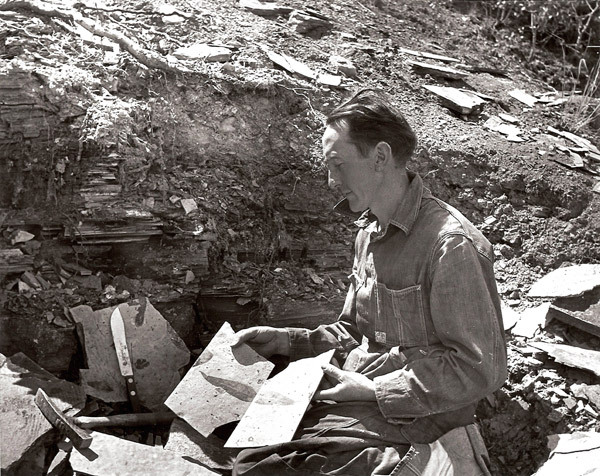 Middle: Harry MacGinitie splits shale at Florissant with a rock hammer and butcher knife. 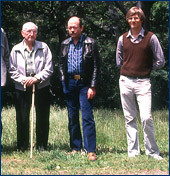 Right: Harry MacGinitie, Jack Wolfe and Herb Meyer at Berkeley circa 1980. Wolfe worked on the maples, paleoclimate and paleoelevation of Florissant. Note: Collection of fossil material is illegal unless done under a permit from the National Park Service. 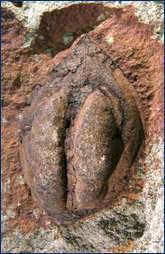 If you think you have found a fossil on National Park lands, please contact a park representative. Visit the National Forest Service's Florissant website. Go to the Friends of the Florissant Fossil Beds website. The Friends are a nonprofit group that supports the National Monument. 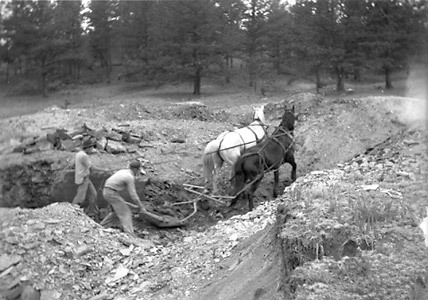 See a list of papers (with abstracts) concerning the paleontology and geology of the Florissant Fossil Beds that appeared in a 2008 Geological Society of America Special Papers publication. Evanoff, E., K.M. Gregory-Wodzicki, and K.R. Johnson (eds.). 2001. Fossil flora and stratigraphy of the Florissant Formation, Colorado. Proceedings of the Denver Museum of Nature and Science Series 4, No. 1. Leopold, E.B., and H.W. Meyer. 2012. 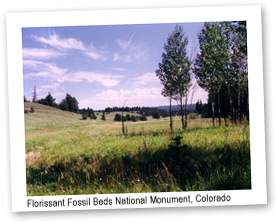 Saved in Time: The Fight to Establish Florrisant Fossil Beds National Monument, Colorado. University of New Mexico Press. 168 pp. MacGinitie, H.D. 1953. 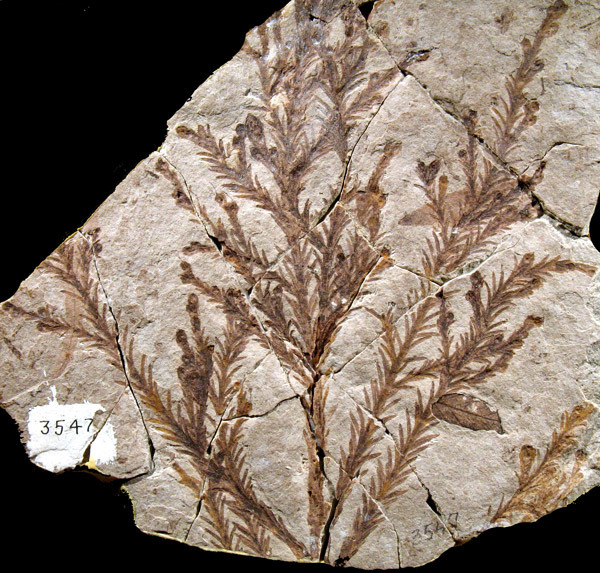 Fossil plants of the Florissant beds, Colorado. Carnegie Institute of Washington Publication 599:1-198. Meyer, H.W. 1986. An evaluation of the methods for estimating pasleoaltitudes using Tertiary floras from the Rio Grande rift vicinity, New Mexico and Colorado. Ph.D. diss. University of California, Berkeley. 217 pp. Meyer, H.W. 2003. The Fossils of Florissant. Smithsonian Books, Washington and London. 258 pp. Meyer, H.W., and D.M. Smith. 2008. Paleontology of the Upper Eocene Florissant Formation, Colorado. Geological Society of America Special Paper 435. 177 pp. Wolfe, J.A., and T. Tanai. 1987. Systematics, phylogeny, and distribution of Acer (maples) in the Cenozoic of western North America. Journal of the Faculty of Science, Hokkaido University, series IV. Geology and Mineralogy 22(1):1-246. Wolfe, J.A., C.E. Forest, and P. Molnar. 1998. Paleobotanical evidence of Eocene and Oligocene paleoaltitudes in midlatitude western North America. Geological Society of America Bulletin 110(5):664-678. Wolfe, J.A. 1995. 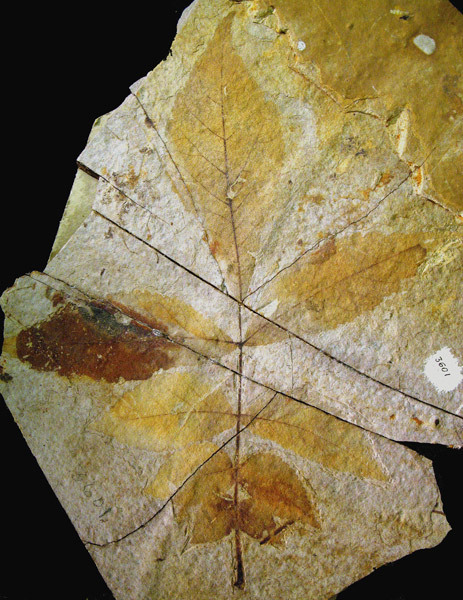 Paleoclimate estimates from Tertiary leaf assemblages. Annual Review of Earth and Planetary Sciences 23:119-142. Florissant fossil images by Diane Erwin; horses photo (FLFO-1016) from the Florissant Fossil Beds National Monument archives; Redwood trio and MacGinitie splitting rocks photos from MacGinitie, 1953 (see reference above); MacGinitie, Wolfe and Meyer photo from the UCMP Archives.